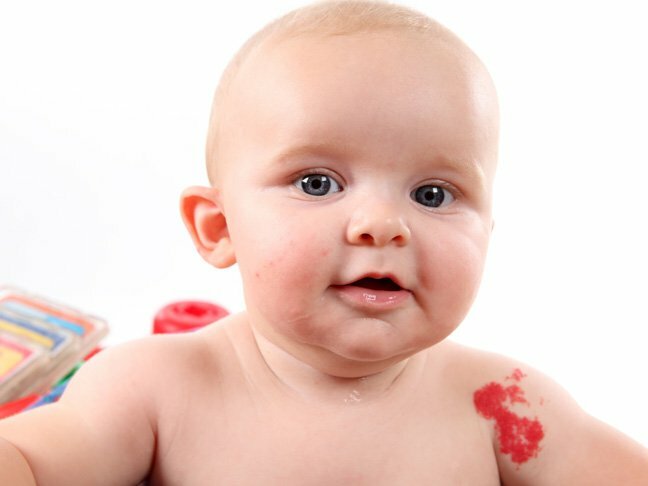 Angel kisses, strawberry birthmarks, stork bites — there are as many euphemisms for a birthmark as there are babies. It’s charming to think of angels gently kissing our newborn’s eyelids, but at the same time, new mothers might feel concerned. Are birthmarks a problem on a newborn baby? Keep reading for everything you need to know about birthmarks. Birthmarks are common variations in skin color and texture. A red birthmark patch on the back of the neck is sometimes called a stork bite while a port wine stain is usually larger and can appear anywhere. A strawberry birthmark is a reddish, berry-like bump while light brown areas are named after café au lait. There are basically two kinds of birthmarks: vascular and pigmented. Vascular birthmarks like angel kisses, stork bites, and strawberry birthmarks are red birthmarks caused by extra or wide blood vessels clumping together. A strawberry birthmark looks like a berry-like bump and might increase in size. Don’t worry; they aren’t harmful and usually disappear by age 10. Port wine stains are larger, but unlike strawberry marks, they don’t go away on their own and may need treatment if they’re near the eye. Pigmented birth marks include moles, café-au-lait spots, and Mongolian spots. Almost all are harmless although very large moles can be a cancer concern, and several large café-au-lait spots might indicate neurofibromatosis. Mongolian spots resemble bruised skin, but they are painless and will usually fade. If you have questions, ask your pediatrician. Does my baby’s birthmark need medical attention? Some birthmarks may need medical attention. Birthmarks like moles and café-au-lait spots may need to be looked at for underlying issues such as neurofibromatosis or cancer, but strawberry birthmarks are usually harmless. Port wine stains are a little trickier. Sometimes associated with the rare condition known as Sturge-Weber syndrome, port wine stains near the eye may cause impairment if not treated. Obviously, if any birthmark changes shape or begins bleeding or itching, it’s important to see a doctor. Ultimately, your child’s skin is as personal and beautiful as the rest of them. A birthmark can be more than a skin tone variation: It can become an individual signature. Marilyn Monroe, Cindy Crawford, and Mikhail Gorbachev all had unique features that helped make them iconic symbols.